Program Tour: Time 08:30 a.m. – 15:30 p.m.
08.30 a.m. Pick up at the hotel. 09.00 a.m. Depart from the pier. Chicken Island: Enjoy sightseeing, swimming and snorkeling among coral reef and fish. Think of the name of the island when you see the funny rock shape. Tup Island: One of Thailand’s unseen highlights. Relax on the white sandy linkage between Tup Island and Chicken Island at low tide. Poda Island: Relax for sunbathing and see sports. Lovely white sandy beach ideal for sunbathing, swimming and snorkeling. Phra Nang Cave: Visit Phra Nang Cave to learn the history of the sacred image for the local people and to see the spectacular of the stalagmites and the stalactites. 15.30 p.m. Arrive at Ao Nang Beach and transfer back to the hotel. Tour includes: Lunch, snack, fresh fruits, soft drink, life jacket, snorkel equipment,include fee Natural Park Entrance Fees, experienced guide and insurance. Remark: In case of eather changes or other obstacles, the program tour will be changed for suitability without prior notice. Tour includes: Lunch, snack, fresh fruits, soft drink, life jacket, snorkel equipment, include fee Natural Park Entrance Fees, experienced guide and insurance. Program Tour: Time 08.30 p.m. -15.00 p.m.
08.30 a.m. Pick up at Ao Nang and transfer to local pier. 09.00 a.m. Transfer to Hong Islands passing by the Royal Palace and Klong Muang, located in Klong Muang. Sightsee at Hong’s “room” lagoon inside the island with high towers of limestone cliffs on all sides. Hong Island: National Park office, fantastic white powder sands, sun and shade, picnic tables and toilets facilities, ideal place for lunch. Pakbia Island: Two of Hong’s archipelago with unspoiled beauty and opportunities for swimming and sunbathing. Tour includes: Lunch, snack, fresh fruits, soft drinks, life jacket, snorkel equipment, include fee Natural Park Entrance Fees, experienced guide and insurance. Program Tour: Time 08.00 a.m. -16.30 p.m.
08.00 a.m. Pick up from hotel and go to pier. 09.00 a.m. Depart from the pier to Hong Island by Long-Tail boat. 09.30 a.m. Head off to Koh Hong. Your guide will explain how to kayak and about the destination on the beautiful lagoon surrounded by limestone cliffs and an array of plant-life. Afterwards you will return to the white sandy beach. 12.30 p.m. Enjoy a Buffet lunch on the beach.13.30 p.m.Go by long-tail boat to Lading Island. Here you can snorkel, sunbathe and see an array of fish species. Next to Daeng Island – a small island known for good snorkeling. 16.30 p.m. Arrive at the pier, transfer to the hotel. Program Tour: Time 08.00 p.m. -16.30 p.m.
8.00 a.m. Pick up at the hotel. 9.00 a.m. Depart from Nopparattara Pier. Bamboo Island: Swim, snorkel and relax on the beach. Phi Phi Lay: The second largest island of the archipelago. Viking Cave: Where they can get Bridnet. Pi Leh Bay: Beautiful lagoon and Crystal pool. Loh Sama Bay: Enjoy with colorful fish. Maya Beach: The shooting location of the famous movie “The Beach”. Phi Phi Don: Lunch time at local restaurant. Go shopping and relax on the beach. Monkey Beach: For more fun color coral reef snorkeling. 16:30 p.m. Arrive at the hotel. Tour includes: Lunch, snack, fresh fruits, soft drinks, life jacket, snorkel equipment,include fee Natural Park Entrance Fees, experienced guide and insurance. Program Tour: Time 12.00 p.m. – 20.30 p.m.
12.00 p.m. Pick up at the hotel. 09.00 a.m. Depart from pier. We depart in the afternoon when most boats are returning so the sites to visit are more peaceful. We take you to 7 islands for a mix of beautiful beaches and snorkeling by the reef. Tunnel swim directly through an island! You can see variety of fish, sea snakes, coral, maybe see harmless black tip reef sharks and definitely Nemo !! Also, Bats flying overhead at sunset while we enjoy BBQ Chicken & Seafood on a pearly white beach watching the sunset. Experience the Amazing Bio-Luminescent Glowing Phosphor as seen in “ The Beach”. 20.30 p.m. Arrive Ao Nang Beach and transfer back to hotel. Program Tour: Time 08.30 a.m. – 16.00 p.m.
09.45 a.m. Arrive at the Hot Spring where you can relax on the unseen juggle bathtub with temperature about 40 – 50 the degree Celsius. Aside from the hot spring, there are hot water pool which is created like spa system, good for relaxation. 12.00 p.m. Have lunch in a restaurant in front of Crystal pool‘s entrance. 13.00 p.m. Start hiking into the rain forest along with many natural springs and pools. The largest pool called “Emerald Pond” never dries up. 14.30 p.m. We will visit Tiger Cave, which was inhabited by the last tiger of Krabi, is now a Buddhist temple famous for meditation. 16.00 p.m. Transfer back to the hotel. Tour includes: Lunch, snack, fresh fruits, soft drinks, life jacket, snorkel equipment, experienced guide and insurance and National Park Entrance Fee. Welcome you to the friendly trip of Ao Tha Lane. The fascinating canyon, lagoon, limestone historical painting and sea gypsy grave will make you amazed. Kayaking will consume your energy to the fun adventure. You will enjoy paddling the kayak through mangrove atmosphere. Along the way, you will get to see the ecological abundance in mangrove area and sand bank. Plus, for more exciting experience, you might have chance to see many kinds of animals like monkeys, mud keepers, crabs and shells. To end the trip, let’s swim in the crystal steam! Have fun! 09.00 – 09.45 a.m. Depart from Ao Nang to Ao Tha Lane. ​​16.30 p.m. Back to the hotel. Tour includes: Lunch, snack, fresh fruits, soft drinks, life jacket, snorkel equipment, experienced guide and insurance, hotel transfers. Program Tour: Time 08.30 a.m. – 12.00 p.m.
08.30 a.m. Pick up at the hotel and depart to Ao Tha Lane. 10.00 a.m. Depart from Ao Nang to Ao Tha Lane. 12.00 p.m. Back to the hotel. Program Tour: Time 08.30 a.m. – 16.30 p.m. Transfer to Bor Thor Village by Mini Bus. Take about 40 minutes. Paddle to see “Tham Lod Tai” where there is a tunnel under the limestone mountain where many splendid stalactites gathered at the entrance. Paddle to see “Tham Pee Hua Toh” , a big airy cave.On the wall of this cave are many prehistoric painting and the layers of archeological shell formation. Paddle to see “Tham Khao Wong” , the gorgeous inner lagoon. Maybe you are lucky to see some Dusky Langur or Leaf Monkeys there. Then to “Tham Lod Nua” where there are splendid stalagmite tunnels. Back to the village, where you can swim in the crystal clear pool or take a walk in the beautiful area. Tour includes: Lunch, snack, fresh fruits, soft drinks, life jacket, snorkel equipment, tour guide license and insurance. Program Tour: Time 08.30 a.m. – 13.30 p.m.
Start paddling the kayak through the magnificent scenery of mangrove forest. Paddle to see “Tham Lod Tai”. There is a tunnel under the limestone mountain where many splendid stalactites gathered at the entrance. Paddle to see “Tham Pee Hua Toh” , a big airy cave. On the wall of this cave are many prehistoric painting and the layers of archeological shell formation. 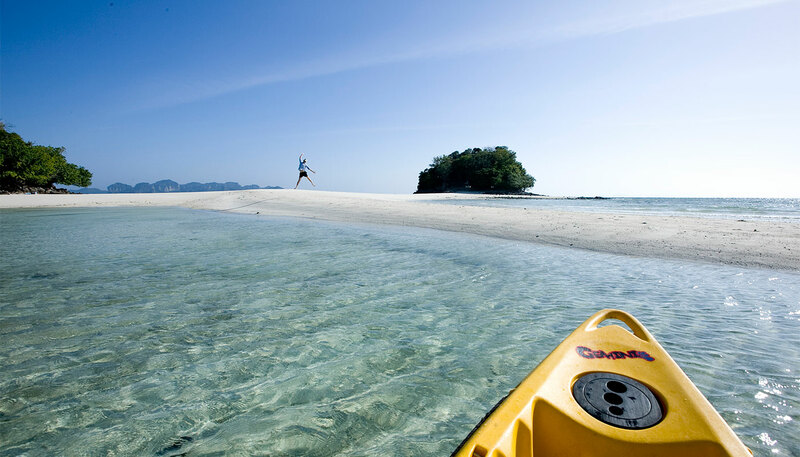 Paddle to see “Tham Khao Wong” the gorgeous inner lagoon. Back to the village for home cook lunch. Transfer to Bor Thor Village by Mini bus. Take approximately 40 minutes. 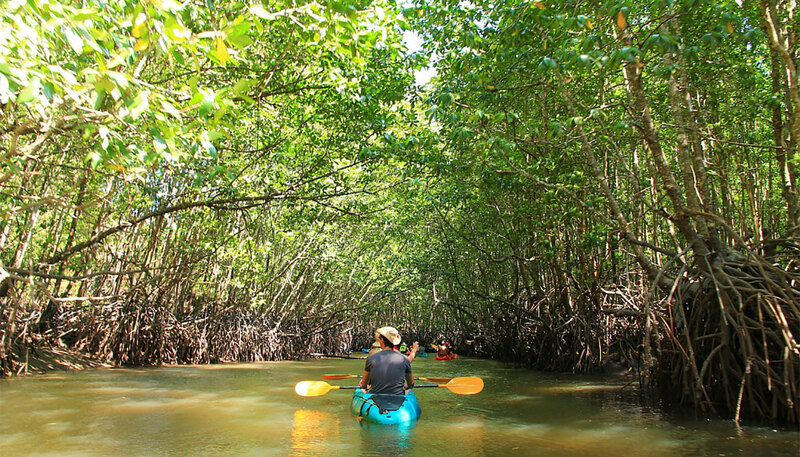 Start paddling through the magnificent mangrove forest. Paddle to see “Tham Lod Tai” where a tunnel takes you under the limestone mountain. There are many splendid stalactites and stalagmites gathered at the entrance. Paddle to see “Tham Pee Hua Tho” , a spacious and airy cave.On the wall of this cave are many prehistoric paintings and layers of archeological shells. Lunch is served at the Riverside restaurant. Trek through beautiful natural surroundings. Time to enjoy a refreshing swim in a cool stream. Experience mew thrills feeding the elephants. You can buy souvenirs at this time also. Program Tour: Time 08.30 a.m. – 13.00 p.m. Arrive to “Tiger Cave Temple” (please wear proper dress in temple),visit a meditation center in south of Thailand. Here you can explore Buddha images, giant trees and temple pagodas. Visit Krabi landmark “Giant Crab’ and take a picture. Tour Includes: Round Trip Transfer, Insurance and English Speaking Guide. Please bring: Sunglasses, Hat and Camera. You have day and night to explore and fall in love with this city. Program Tour: Time 13.00 a.m. – 20.00 p.m.
Visit “Tiger Cave Temple” (please wear proper dress in temple),visit a meditation center in south of Thailand. Here you can explore Buddha images, giant trees and temple pagodas. Visit Krabi landmark “Giant Crab” and take a picture. Arrive at Night Market, shoping buy some food, fruit and Krabi souvenir. Program Tour: Time 10.00 a.m. – 17.00 p.m. Explore amazing historic Cave of Krabi. Enjoy watching many kinds of fish at fish farm. Lunch at the fish farm and seaside restaurant. Visit the island and village by Skylab (Local Taxi). Tour Includes: Round trip transfer (Minivan, Longtail Boat, Skylab or Local taxi), English speaking guide, Thai set lunch (Sea Food), Refreshment, Insurance and Fully trained staff for your safety. 1. In case of weather changes or other obstacles, the program tour will be changed for suitability without prior notice. 2. This program is not recommended for pregnant guest. Program Tour: Time 08.30 p.m. -17.00 p.m.
08.30 a.m. Pick up at the hotel by Mini Bus. 09.00 a.m. Depart to Phang-Nga province. 10.30 a.m. Arrive at Phang-Nga pier (Phang-nga national park) and transfer to long-tail boat. Enjoy viewing the spectacular scenery of Phang-Nga Bay (The national Park), the surrounding mangrove forest Khao Majoo and the limestone mountains at Tham Lod. 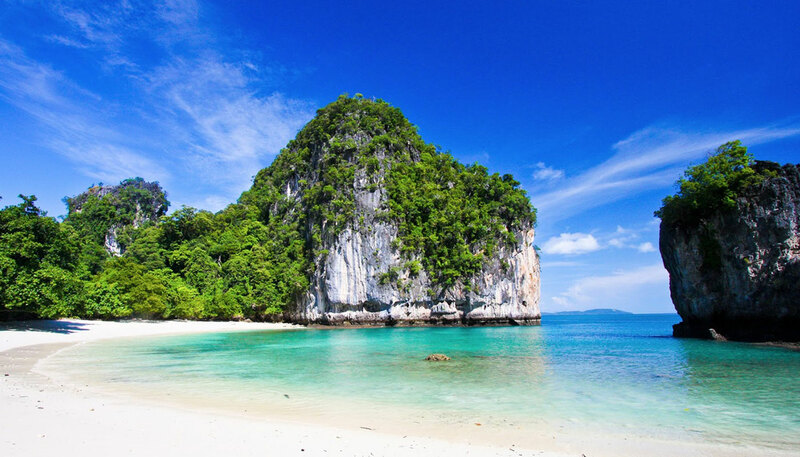 Visit Khao Ping Gan and Khao Tapoo as known as James Bond Island. 12.30 p.m. Visit Fishing Village and enjoy delicious seafood for lunch at Koh Panyee. Learn about the local life of people or go shopping. 13.30 p.m. Back to the pier and depart to visit “Suwankuha Temple” or “The Monkey Cave Temple” Enjoy the interior and surrounding cave and pay respect to the great beauty, the 15 meters long reclining Buddha image. 16.20 p.m. Back to Krabi. 17.00 p.m. Arrive at the hotel. Tour includes: Lunch, snack, fresh fruits, soft drinks, life jacket, snorkel equipment, experienced guide, insurance and National Park Entrance Fee. This town is a traditional lighting village on the island. You will spend a night there with full board. You can share experience with Thai Fisherman, learn and operate the traditional methods used to catch squid, crab and fish. Parts of your catch become your meal. School life and a real sea gypsy village are included. 09.30 a.m. Depart from Hotel to Laemkruad Pier. 11.00 a.m. Check-in at your home stay, community resort, 1-storey accommodation, seashore, fan or local Bungalow. 11.30 a.m. Hosted lunch by community. 13.00 p.m. Learn how to be a Fisherman with villager. Take a long-tail boat to operate the traditional methods to catch squid, crab and fish. Also, Learn to plant sea grass. For more quality activity, Let’s restore nature to communities.Have your collected seafood cooked for dinner. 18.00 p.m. Dinner with the locals, BBQ style. 21.00 p.m. Leisure and free time. 07:00 a.m. Community life sightseeing. Breakfast at Co-pe or the community center. 09.00 a.m. Back to the accommodation and check out. Tour Includes: Lunch, Snack, Fresh fruits, Soft drinks ,Life jacket, Snorkel equipment, Experienced guide and insurance. Remark: Minimum 4 pax per trip. In case of weather changes or other obstacles, the program tour will be changed for suitability without prior notice.